The striper bite is doing OK along the Colorado River here below Davis Dam. The casino area is producing a few along with the upper big bend area where anchovies are working well along with various hard baits. 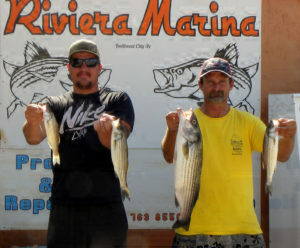 Our local angler Randy Brown (above-right) and his visiting son-in-law Parker Harding were fishing off their dock using the long a bomber and landed these stripers. The larger one was 6.14 pounds at 26 and 1/4 inches. The smaller ones were hooked and couldn’t be released due to hook damage. Always check your fish before releasing. We are not having much trout action mostly due to our warmer weather. The trout bite will be back soon and our weather will start to cool some. I will try and find out about our next rainbow trout stocking. Which should be coming up soon. 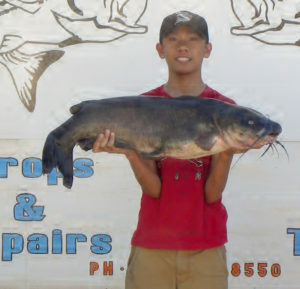 But the catfish are on the prowl so to say our local Mohave high school student Charles Rolda (above), who came in to show off his channel cat at 21.34 pounds at 34 inches. Charles was fishing from shore up on Lake Mohave near the dam using anchovies when he landed this just-under 22-pound channel cat. This took him a while to get it in as he was using light line. 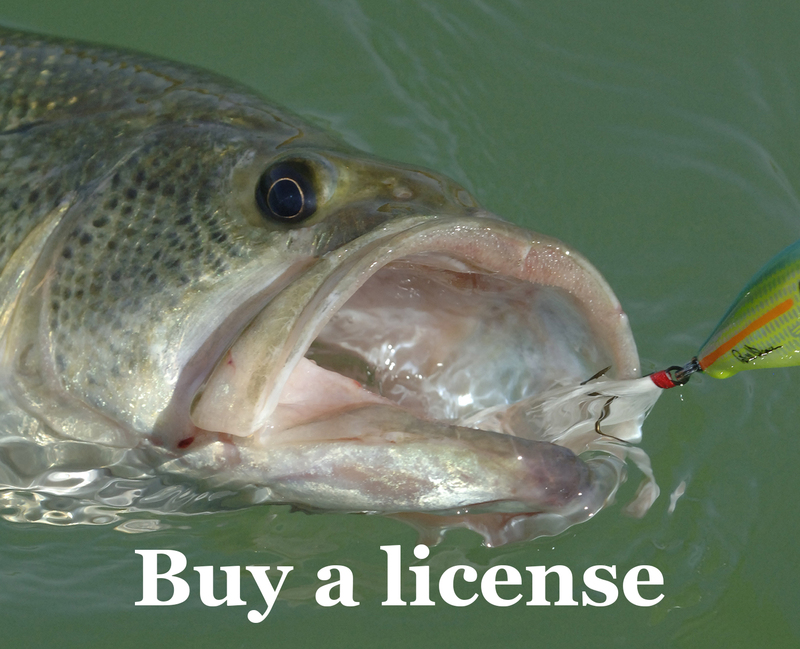 Lake Mohave is doing well and producing a few smallmouth bass and back in the coves you can find a largemouth now and again. The striper bite is still slow with late evenings being a better chance at catching these line sides. 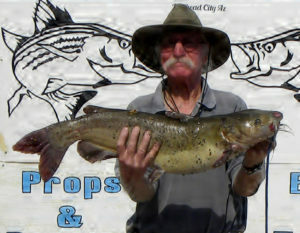 The catfish bite here along the Colorado River is starting to give up a few, and no I didn’t catch this one: I am holding a 12.5-pound cat at 30 1/2 inches (above) and it was Lynn Hall of Bullhead City who landed this fish using anchovies. I was caught a little off guard on this shot. It was brought in for Gary Regan of the local high school fishing club. He did pick up his fish a bit later. The Topock Marsh is producing both channel cat and some largemouth action. Spinnerbaits seems to be a great choice with white or green working the best. We hope this helps for now, and thanks for all of your support. See you in soon to share that catch.